Mr. Snowman, The Winter Throne and the Christmas Blocks Gacha items are available at F R O S T. Both Mr. Snowman and The Winter Throne include eight static poses. The Christmas Blocks Gacha contains four commons and two rares. 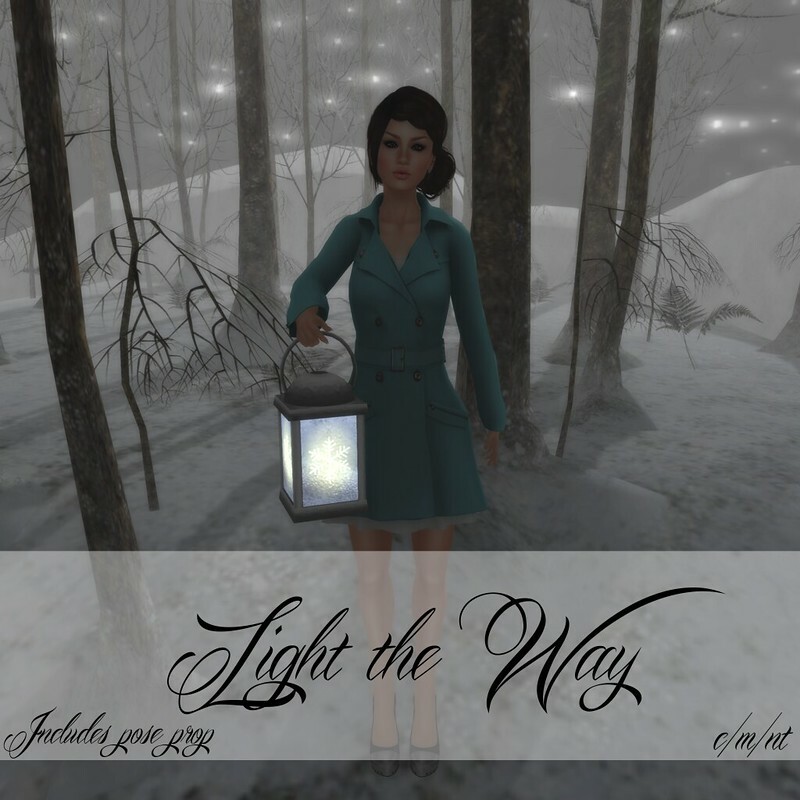 Light the Way includes five static poses and a pose prop. This set is available at Gothmas by Gaslight. The Snow Queen includes five static poses and an ice tiara. This set is available at The Seraphim Social. The Victorian Salone chair includes six static poses. This pose prop is available at Genre. Hint: Maybe I’ll see some birds while hanging here. Hint: I really love music! New VIP Gift (50L join fee) includes three poses plus mirror poses. Simply click the gift board with an active group tag to receive the gift. Today is also the last day of the 50% Off Black Friday Sale & Hunt. Everything in the store (excluding gachas and single poses sold via pose stands) has been reduced by 50%. I have also hidden each pose in my newest pose pack around the store in pink shopping bags priced at 5L each. Black Friday Sale and Hunt! 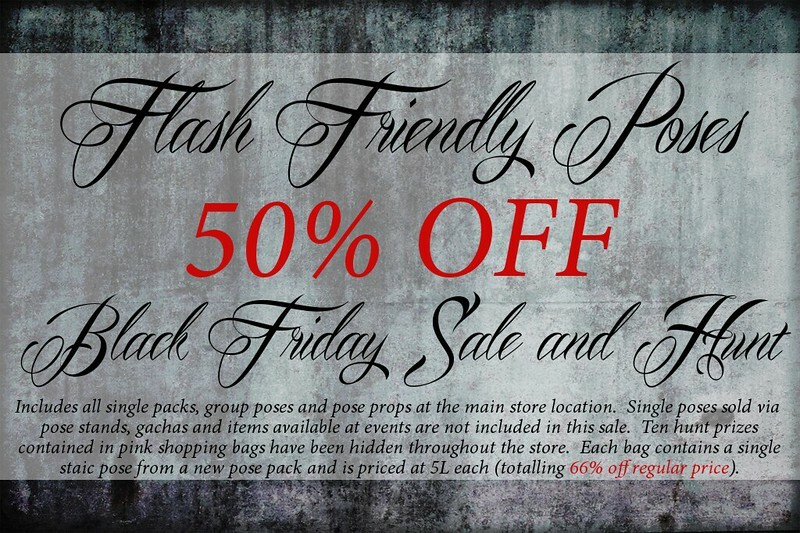 All single pose packs, group poses and pose props have been marked down by 50% for Black Friday! This sale does not include poses available via pose stands, gachas and items available at events. Ten poses from a new pose pack have also been hidden throughout the store in pink shopping bags priced at 5L each. The purchase of all ten poses totals 66% off the price of a normal single pose pack! I released a new installment of the Lyrically Inspired Series last week at Posetastic. 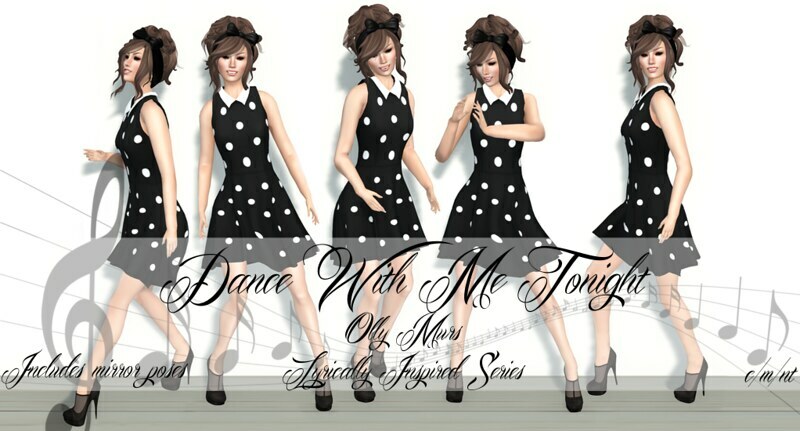 The set includes five static poses plus mirror poses and was inspired by Dance With Me Tonight by Olly Murs. The set will be available at the venue through November 30th; afterwards it will be available at the main store location. A new stands set is available at Pure Sales Room and is priced at 50% off. The set includes five static poses plus mirror poses. You will have until December 8th to pick up the pose set at the discounted price. Afterwards, it will be available at the main store location. I have started a new series of poses inspired by the music I love. One of the first sets, Wake Me Up, is available at The Thrift Shop for 50% off normal price! I also have a few older releases available there priced at 50% off as well. Two new poses are available at Designer Showcase. Applause is the second new set of the Lyrically Inspired Series. It includes five static poses plus mirror poses. By Your Side is a couple’s pose also available at the showcase. I have joined a new sales event called Pure Sales Room. You can pick In Your Arms and an older pose set up at the event at a discounted price. I have a new pose set and my first ever couples pose available today at the Designer Showcase. Both will be available exclusively at the event through its duration (September 28th). It has been a bit hectic for me in real life this month since I started back to work, but I do finally have the new group gifts out! They are available at my new main store location which is in a bit of a mess at the moment. I’m in the process of changing all of my vendors; so, please overlook the randomness. There is a 50L join fee for the VIP group. The newest addition to The Literary Series is now available at The Seraphim Social. 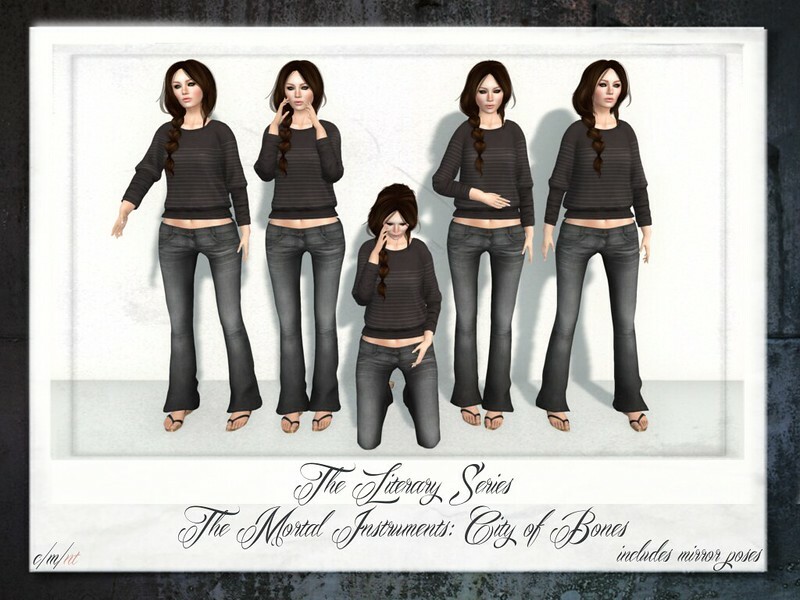 This set is inspired by The Mortal Instruments: City of Bones by Cassandra Clare. The set is exclusive to the event and will be available in my main shop afterwards. I’m participating in the Summer Hangover Hunt on the Jersey Shore. Through August 31st you can pick this pack of poses up for only 10L. The hunt item you are looking for is a crushed can. I released my first ever pose prop this past week at Genre for the East Asia: Lotus round. The set includes five poses plus mirror poses and a mesh flower in four colors. Finally, I have a set of poses out at Designer Showcase created especially to use with jewelry. The set includes five poses plus mirror poses. As some of you may know, Squinternet Larnia, owner and designer of Donna Flora, has been battling cancer since 2011. She has recently taken a turn for the worse and her friends have put together a charity event to help raise money for alternative treatments that Italy’s national health insurance will not pay for. I have loved and admired her work for so many years and wanted to do something to help; I have two sets of poses out at the event with 100% of the profits being donated to Squinternet. The event runs through August 11th, and you can check out the photos of all the items at Seraphim.